Did you know Disney has a honeymoon registry ? | What's Up With The Mouse? Disney has a honeymoon registry (www.disneyhoneymoonregistry.com) for couples planning a honeymoon at the Walt Disney World Resort, onboard Disney Cruise Line or at a Disney Vacation Club Resort. The Honeymoon Registry is a complimentary online service that will make it easier for couples to pay for their Disney honeymoon expenses. Couples simply plan their getaway and family and friends can contribute monetary gifts toward the couple’s honeymoon as their wedding gift. The gifted funds are credited to a special Disney Gift Card for Honeymoons, which the couple can use to pay for their expenses both before and during their honeymoon. What is Disney’s Honeymoon Registry? Disney’s Honeymoon Registry is a complimentary online service for couples planning a honeymoon at the Walt Disney World Resort, aboard Disney Cruise Line, or at a Disney Vacation Club Resort. With the Honeymoon Registry couples can plan their romantic getaway, and family and friends can contribute monetary gifts toward the couple’s honeymoon as their wedding gift. What are the benefits of the Honeymoon Registry for couples? Many couples use honeymoon registries as their primary registry for their wedding, and Disney’s Honeymoon Registry gives honeymoon couples the ability to make the most out of this once-in-a-lifetime experience. The Honeymoon Registry provides a fun, convenient experience for family and friends, and couples can enjoy their engagement time even more knowing that their honeymoon plans are secure. After making their reservation, couples can visit www.disneyhoneymoonregistry.com to select the products and services they want on their “wish list” of honeymoon desires. They then share their registry “wish list” with family and friends. Family and friends can view the couple’s Honeymoon Registry online and contribute toward items on their list. The gifted funds are credited to a specially designed Disney Gift Card for Honeymoons, which is sent to the couple prior to traveling. 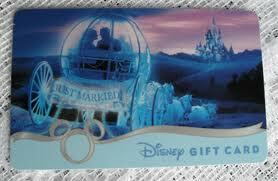 The couple uses the Disney Gift Card for Honeymoons to pay for their expenses both before and during their honeymoon. How do couples use the Disney Gift Card to pay for their Disney Honeymoon expenses? As gifts from family and friends are made on the website, funds are credited to their Disney Gift Card for Honeymoons. Before they leave for their Disney honeymoon, they can use the gift card as a form of payment for reservations and deposits. During their honeymoon they can use the card for purchases at participating locations. What products are available in the Honeymoon Registry? Couples can select from a variety of products and services that are available during their Disney honeymoon and can be purchased with a Disney Gift Card including room accommodations*, spa treatments, dining, recreational activities and evening entertainment. Couples on a Disney Cruise cannot use the Disney Gift Card for Honeymoons to book the stateroom portion of their vacation; however, they can use it to register for shore excursions and various onboard expenses. Please note that at this time, the Disney Gift Card for Honeymoons cannot be used to book a Disneyland Resort vacation. *For travel packages purchased from a third party wholesaler and not directly from Disney, the Walt Disney World room and ticket portion cannot be gifted through the registry. However, the Honeymoon Registry can be used for all other Disney products and services available during the honeymoon. Only the Primary Guest on the registry is able to sign in to change account information or manage funds. Does it cost anything to use the Honeymoon Registry? The Honeymoon Registry is a complimentary service for Disney Honeymoon couples. Standard shipping for the Disney Gift Card is free. There is a nominal charge for express shipping. When can gift funds be contributed through the registry? Family and friends can contribute gift funds from the moment the registry is activated until just before the end of the honeymoon stay (checkout from a Disney Resort or end of the cruise). What happens if the honeymoon is postponed or cancelled? Gift funds purchased through the Honeymoon Registry are credited to the couple’s Disney Gift Card for Honeymoons and are non-refundable. Because the gift card does not expire, funds remain on the card until used. Gift card funds can be used at all participating locations that accept the Disney Gift Card. For a list of participating locations, please see the section below – Who accepts the Disney Gift Card for Honeymoons? When should couples start their Honeymoon Registry? We recommend that your clients start their registry as early as possible, and at least 15 days prior to their honeymoon. They can begin creating their Honeymoon Registry as soon as you have a reservation number for their Disney honeymoon. Starting their registry early enables family and friends to give gift funds toward their honeymoon well in advance. They can present the couple with a card at an engagement party or wedding shower, as well as on their wedding day, informing them of their gift. The sooner they receive their honeymoon gifts, the sooner they can begin booking the experiences they want for their honeymoon. Many activities are unique and special with limited availability, so advance booking is always recommended. And with everything in place early, there is only one thing left for them to do – start packing! What if couples want to register for a Disney product or service not found in the registry? Couples can register for Magic Money, which they can use for a specific Disney product or service they have in mind that is not listed in the registry catalog. How do couples tell family and friends about their Honeymoon Registry? Couples can share their Honeymoon Registry with family and friends in a number of ways: Include their Honeymoon Registry web address with their wedding communications, such as emails and/or their own personal website. Create and print custom enclosure cards on the Honeymoon Registry website to include with their wedding and/or shower invitations. Give enclosure cards to immediate family members and their maid-of-honor, as these are the people their wedding guests will likely contact for registry details. How do couples book the honeymoon experiences they have chosen for their registry? Each item in the couple’s registry contains booking instructions in the item details. Honeymoon couples are solely responsible for making arrangements, or requesting that Castle Dreams Travel make arrangements, for the Disney products and services they want. When can couples make dining and recreation reservations for their honeymoon? Most dining and recreation reservations can be made up to 180 days in advance to your visit. Gifted funds on your Disney Gift Card for Honeymoons can be used for deposits and/or pre-payments when required. Please note that all cancellation policies still apply. We recommend they make reservations as soon as possible to ensure they get the date and time they want. There are special dining reservations and recreation/entertainment activities that may have limited availability. They can still book experiences after they arrive, subject to availability. Can couples see who has given them gifts from their registry? If family and friends choose to leave their name and a message when giving a gift, that information displays in the couple’s Guestbook. Who is responsible for managing the Honeymoon Registry account? The person who creates the Honeymoon Registry account is designated as the Primary Guest and becomes the sole owner of the account. The Primary Guest is responsible for the funds and personal administration of the account. Should they cancel or postpone their Disney Honeymoon after funds have been gifted, the Primary Guest retains the Disney Gift Card for future use. When does a gift become available on the couple’s gift card? Gift funds are available on the gift card from the moment they are contributed on the web site. We recommend giving the gift as soon as possible, as the couple may need to submit a deposit or prepayment for some items in their registry. How does the couple know when they have received a gift? A gift is updated on the registry immediately after the purchase is made. If the couple has chosen to receive gift notifications, they will receive an email announcing the gift. They can also print a card to present to the couple at a wedding shower or engagement party. Can several friends and family contribute together toward a larger gift item? Yes. There are two ways for groups of family and friends to join together to purchase a gift. Everyone completes their own transaction to contribute an incremental amount toward a specific gift. For example, if the gift is $100 and there are 10 people, each person contributes a $10 increment and gives their own name when completing the transaction. One person makes a single transaction and includes everyone’s name on the card. In this case when completing the transaction, in the From field enter “All of us” then enter each person’s name in the message area. Can friends and family surprise the couple with a special gift sent directly to their Walt Disney World Resort hotel room or Disney Cruise Line stateroom? Yes. Visit the honeymoon couple’s registry to find recommendations for the perfect surprise gift. Arrangements can be made for the gift to be in the room when the couple arrives. To select a special gift and schedule delivery: For Walt Disney World® Resort hotels call WDW FLORIST at 407-827-3505, or visit www.disneyflorist.com For the Disney Cruise Line® call 800-601-8455, or simply contact your travel planner at Castle Dreams Travel. Is the Disney Gift Card for Honeymoons different from other Disney Gift Cards? All Disney Gift Cards can be used for the same purchases. The Disney Gift Card for Honeymoons has an exclusive honeymoon design and a larger limit. At any given time the maximum balance on the Disney Gift Card for Honeymoons is $3,000. If the gift card is approaching its limit, we recommend that the honeymoon couple use it to pay for honeymoon expenses in advance. As long as the balance on the card is under the limit, funds can be added to the card through the registry. Who accepts the Disney Gift Card for Honeymoons? At the Walt Disney World® Resort, the Disney Gift Card can be redeemed at select merchandise, food, ticketing, Guest Service and Front Desk locations, select third party lessees and Downtown Disney® District Operating Participant locations. The gift card can also be used for purchases at participating locations at Disneyland® Resort, Disney Stores in the U.S., DisneyShopping.com, Disney Vacation Club Resorts, and aboard the Disney Cruise Line®. The Disney Gift Card is not accepted at McDonalds®, Jellyrolls, Rainforest Café®, the Richard Petty Driving Experience, Disney On Ice, and Disney Theatrical. Tip: If a location does not accept the Disney Gift Card but allows you to charge goods and services to your room, you can do so and use your gift card to pay your room charges. Please note that locations where the Disney Gift Card is accepted are subject to change without notice. Can the Disney Gift Card for Honeymoons be used at other Orlando area attractions? No. The Disney Gift Card is only accepted at participating Disney locations. How soon does the Disney Gift Card for Honeymoons arrive after setting up a registry account? We offer complimentary domestic standard shipping, which takes approximately 7-10 business days after the Honeymoon Registry account is created. To get the card sooner, express shipping is available for a nominal charge. Note that express shipping is required for international deliveries. What happens if all the funds on the Disney Gift Card for Honeymoons are not spent during the honeymoon? The Disney Gift Card for Honeymoons does not expire and funds credited to the card remain until used. After the honeymoon, unused funds are available for future vacations or anniversary trips, and for purchases at all participating locations that accept the Disney Gift Card. For a list of participating locations, please see the section above – Who accepts the Disney Gift Card for Honeymoons? Can the Disney Gift Card for Honeymoons be used to purchase Disney Dollars, Gift Certificates or other Disney Gift Cards? No. The Disney Gift Card is for purchases of select Disney products and services at participating locations. What happens if the Disney Gift Card for Honeymoons is lost or stolen? The Disney Gift Card is just like cash, so please keep it safe. We are not responsible for lost or stolen gift cards. We recommend writing down the card number and storing that information in a separate place. To freeze funds on the gift card and to verify whether a lost card can be replaced, advise your clients to contact a Honeymoon Registry Counselor at 407-566-7272 as soon as possible. Please note that any spent funds will not be replaced. During the honeymoon is there a way to check the balance on the Disney Gift Card? After each transaction the receipt shows the current balance on the Disney Gift Card. The gift card balance is also available by calling the 800 number on the back of the card, or by accessing the Honeymoon Registry account online and viewing the Registry Center page. Is information available on purchases made with the Disney Gift Card for Honeymoons? Yes. To obtain Disney Gift Card purchase details, call the 800 number on the back of the card. This entry was posted in Disney Cruise Line, Disney Fantasy, Disney Wedding, Disney's Dream, Disney's Magic, Disney's Port Orleans- Riverside, Disney's Wilderness Lodge, Disney's Wonder, Fort Wilderness Resort, Magic Your Way Tickets, Walt Disney World, Walt Disney World's Magic Kingdom. Bookmark the permalink. 2 Responses to Did you know Disney has a honeymoon registry ? Your site says that the registry is complimentary, and that there is only a charge for the express shipping of the gift card. It’s my understanding that this is not correct. I received an email from a rep for Honeymoon Wishes who stated that there is a 7% surcharge, i.e., when someone donates $100 the couple receives $93. Is this correct or not? Thanks. I found out the registry has changed over the past few years to better meet the needs of Guests. In that time, it was made global to encompass all Disney Destinations. When those changes were made, they changed platforms. Also the Disney Gift Card is no longer offered. There is a small fee that Guests pay to use the service – this covers things such as a customer care team for their wedding guests, etc. There is a FAQ available on Disney’s Honeymoon Register at http://disney.honeymoonwishes.com/registry/Honeymoon-Registry-Guest-FAQ.